Sometimes (OK, quite often) I run before I can walk. I have a good idea, which is overtaken by a better idea, then I tweak it a bit more and see further possibilities. It all gets too complicated, too ambitious and nothing actually comes of it! After a spell of ill health last summer (if you have a kidney stone, make it a small one, having a 3cm one removed is not a great deal of fun…) I thought I had found a fun project, spinning and knitting socks as a gift for someone. 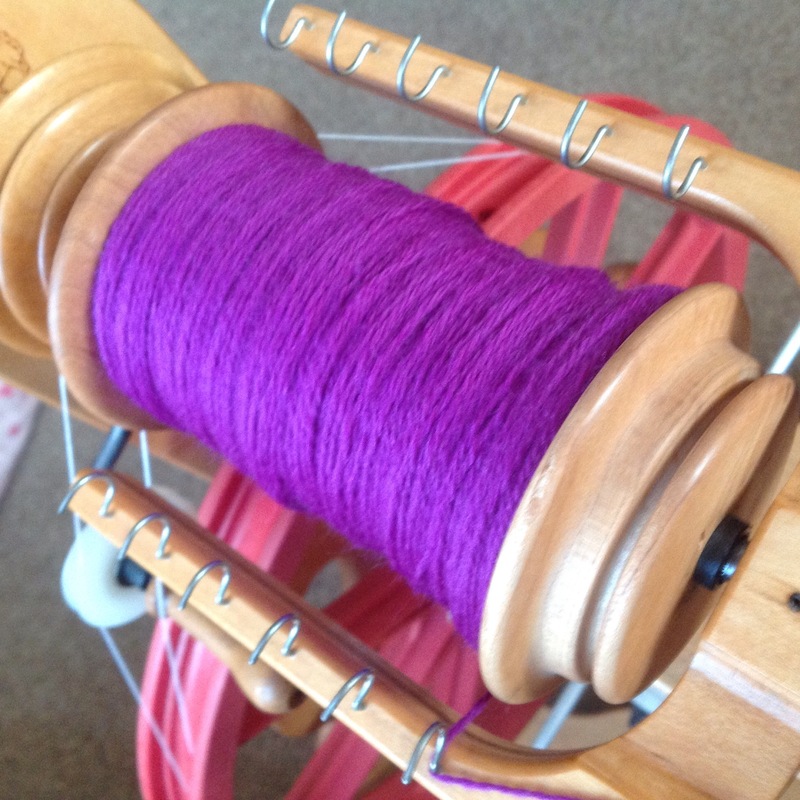 Worried in case I ran short of yarn, I spun 200g of fibre into a 3 ply – making something for someone else made me feel I needed to do things “properly”, none of that chain plying, what if they felt the bumps??? So far so good. The knitting started and then life just kept getting in the way. Then the guilt set in, they sat staring at me every time I sat down, still with just the toes completed. Another spell of ill health and more guilt because I was at home all the time and still the wretched things weren’t getting any further along. Eventually progress was made, and after I gave myself a stiff talking-to I managed to turn the heel at Christmas. I kept thinking ‘if I just did one pattern repeat a day they’d be done by the end of the month’… I kept torturing myself with thoughts that after all the effort they wouldn’t fit – we have the same size feet, but mine are unusually narrow so every time I tried them on they flopped about and it all looked wrong! Finally, finally they are winging their way to their new home. I hope they are worth the wait! The pattern is Coming Together Socks and Violet is not really violent at all, in fact she is generally known as Violet Merino from World of Wool. 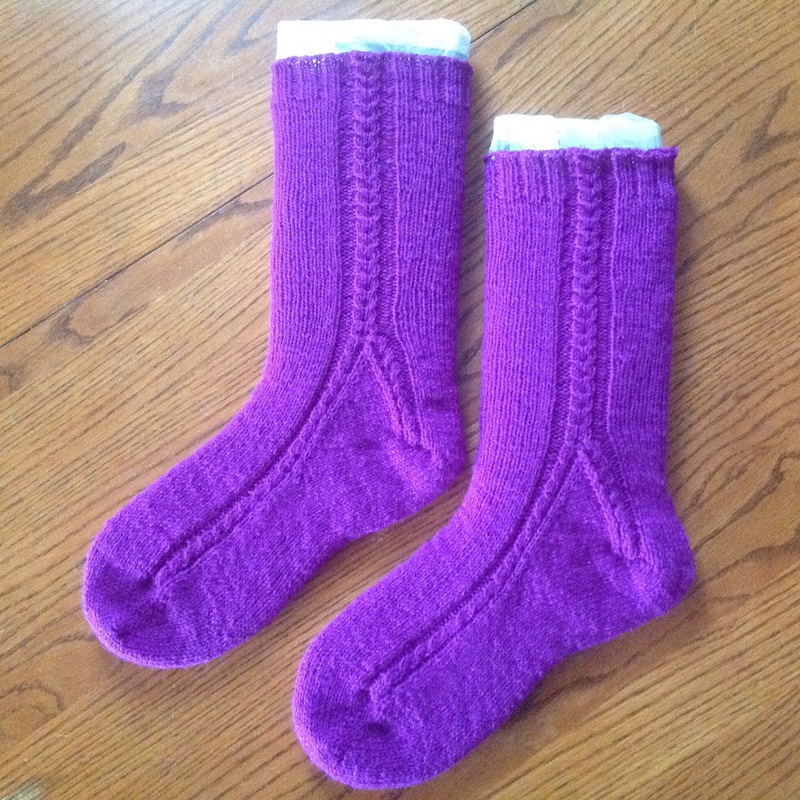 This entry was posted in Knitting, Spinning and tagged Knitting, knitting socks, socks, Spinning. Bookmark the permalink. They are beautiful…so glad you have them finished, there is always a project that blocks us creatively, but when we finally get that job done, we feel immense satisfaction and immediately start thinking of the next project to be done!